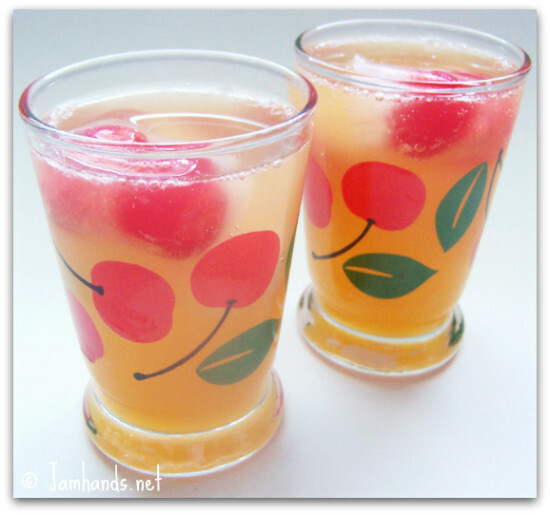 Apricot Coolers are a delicious surprise that quench your thirst and look doubly cute with cherry ice cubes. 1. In a large nonmetal pitcher or punch bowl, combine apricot nectar and lemonade concentrate; mix well. Just before serving, add carbonated beverage. Serve over ice cubes. Makes 22 (8 oz) servings. 2. I made a much smaller batch (1/4 of original recipe) and kept the apricot/lemonade mixture in a tupperware until ready for use. I then filled a glass with ice, added apricot/lemonade mixture to fill 1/3 of glass, then topped it off with 2/3 part of soda. *To make cherry ice cubes, place a maraschino cherry in each section of ice cube tray. Fill halfway with water; freeze until firm. Fill try with water and freeze completely. What a cute idea for a summer sipper. I love it! That looks so delicious. A definite for summer!